Captive Aire Systems - Constructed of 12 Gauge Galvanized Steel. Provides easy access to the bottom of the fan and to the exhaust ductwork for cleaning and maintenance. Ships Loose. Hinge kit provides easy access to the bottom of the fan and to the exhaust ductwork for cleaning and serviceability. Hinge kit for restaurant canopy hood exhaust Fan Used on Fans with wheels 20" or smaller or Fans with bases of 28" or smaller. Constructed of 12 gauge galvanized steel and includes a safety stop feature to prevent the hinge from opening beyond a certain angle, protecting the fan from damage. Includes left and right fan plates, left and right curb plates, and hardware to attach hinge to curb and hinge to base. The safety stop feature prevents the hinge from opening beyond a certain angle protecting the fan from damage. Captive Aire Systems - Heavy duty hinge kit provides easy access to the bottom of the fan and to the exhaust ductwork for cleaning and serviceability. Constructed of 10 Gauge Galvanized Steel. Includes left and right fan plates, left and right curb plates, and hardware to attach hinge to curb and hinge to base. Provides easy access to the bottom of the fan and to the exhaust ductwork for cleaning and maintenance. Ships Loose. Heavy duty hinge kit for restaurant canopy Hood Exhaust Fan Used on Fans with wheels larger than 20" or Fans with bases of 33" or larger. Constructed of 10 gauge galvanized steel and includes a safety stop feature to prevent the hinge from opening beyond a certain angle, protecting the fan from damage. 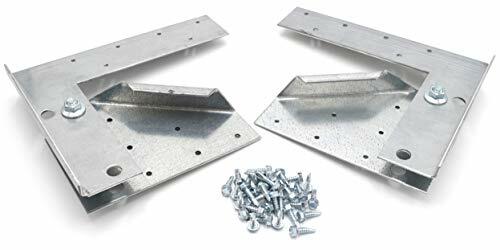 Heavy Duty Hinge Kit for Restaurant Canopy Hood Exhaust Fan Used on Fans with wheels larger than 20" or Fans with bases of 33” or larger - The safety stop feature prevents the hinge from opening beyond a certain angle protecting the fan from damage.